So now that it is summer, for the past week or so I have been eating fruit salads and my morning cereals with a handful of fresh cherries, but towards the end of the week they started looking a bit on the forlorn side. Which is when I decided to cross two of my previous recipes with a twist. 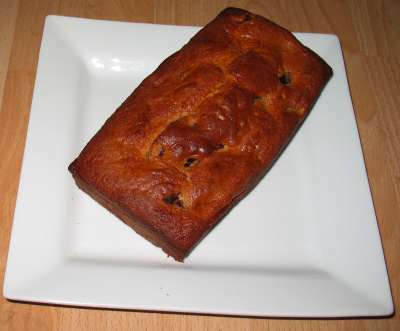 The first time I made Banana, Blueberry and Coconut Bread it was a bit of a disaster and enough time had passed to try it again, in the time between I had made Cherry and Almond Teabread. 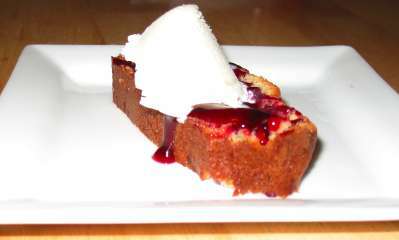 This time I used the main recipe from the Banana, Blueberry and Coconut Bread, but used fresh cherries with flaked almonds. Cream the butter and sugar together, until fluffy. Then add your egg and almond essence making sure the flavours are combined. In another bowl mix the flour, soda and powder, until thoroughly mixed. Rotate between adding a little flour and a little yoghurt, always mixing and finishing up with adding flour. 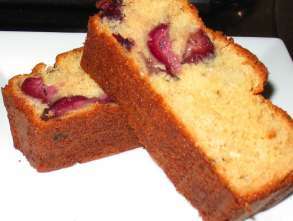 Add just over half the cherries to the batter and pour into a well greased baking tin. Top with remaining cherries and almonds. Bake for around 50 minutes, making sure to turn it so it doesn’t go overly dark on one side. ... but served with cherry jam and ice cream you couldn't tell.